In Plato’s book, The Symposium, the Greek playwright, Aristophanes describes the reason why humans say they found their other half when falling in love. He gives a speech about primates who had double bodies, with faces that turned away from one another. To make a long story short, Zeus, punished these primates by splitting them in half, separating the two bodies. According to Aristophanes, ever since then, people are in search of their other half. Culinary-speaking, there seems to be a similar phenomenon; ingredients, coming from different sources, which seem to innately go together. Cinnamon and sugar is one these pairings. 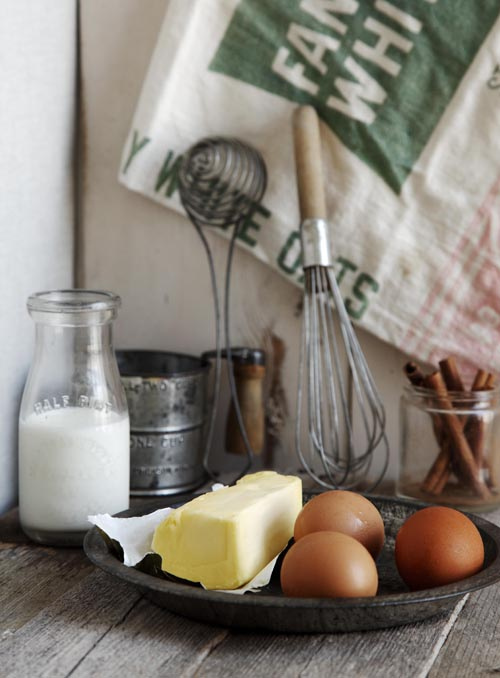 One morning I arrive to Danya’s studio and her Google reader is open onto one of our favorite blogs, Joy the Baker. 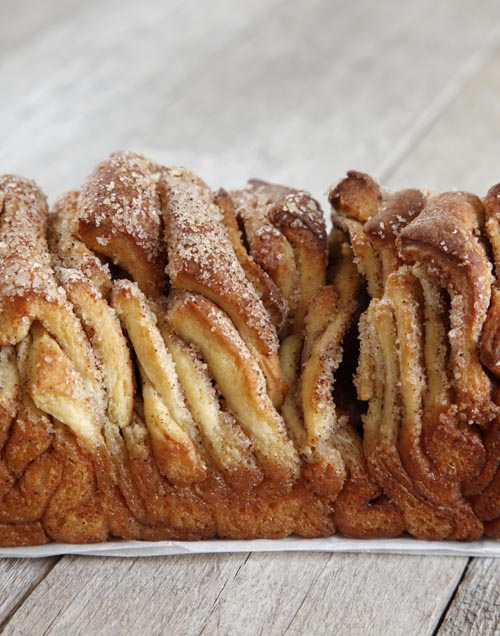 There, staring at us, is a picture of cinnamon sugar pull apart bread. You could literally smell the cinnamon and sugar through the screen. There was no doubt that one of us would have to make this for our blog. Being the more American of the two (Danya was born in the US), this was definitely my type of recipe. I’ve been dabbling in the delightful pair since childhood, when I developed a recipe for French toast (literally just your basic recipe dipped in equal amounts sugar and cinnamon). Being more a cook than a baker, when I try out baking recipes I like to stick to what’s written for the first try. The recipe Joy gives is enough for one loaf. I made this the night before our photo shoot, and me and my husband had to be tortured while the smell filled up our little house. Not even a little taste of it, or I would ruin it for the shoot. Needless to say once this was photographed, it was gone. Oh my goodness, Meghan! You have to , I mean, HAVE TO MAKE THIS! I believe them when they say that after it was photographed, it was gone! It looks wonderful. We need to buy real butter and dry yeast tomorrow, or excuse me, later today! YYYYUUUUUMMMMMYYYY!! emeril said it rite we need “smell a vision” hmmmmmmmmmm good. Your bread looks so delicious! I’ve never tried to do anything with yeast, but its deffinitely something I want to try :). Tell me, when was the first time you used yeast in a recipe? Did you succeed? Was is hard? And could you give me any tips? Follow the recipe and it will work for sure. I did it and it was so easy! Just remember 2 things 1) use new yeast – old yeast can become inactive 2) make sure the butter/milk mixture is just warm to the touch. If it’s too hot it will kill the yeast. ENJOY!!! WOW your cinnamon bread looks sooo good. I would love a slice! And your photography is gorgeous. Prefer quick, easy recipes incorporate ready to back bread or other convenience food, but still comes out like homemade. Thanks! Love your photography! I could learn a lot from you! It looks absolutely fantastic! Thanks for sharing! I read this recipe literally 3 hours ago. My brother and I love baking so we decided to have a cook off tonight. I chose to make this recipe while by brother chose to bake a pumpkin spice cake. My cake is still in the oven so we will wait for results. This is very simple to make. DO not be mislead by the ingredients/ instructions. My house smells so delicious right now! Thanks for sharing this recipe. @ Carolyn Sexton, I don’t think this would be as good using store-bought bread dough. 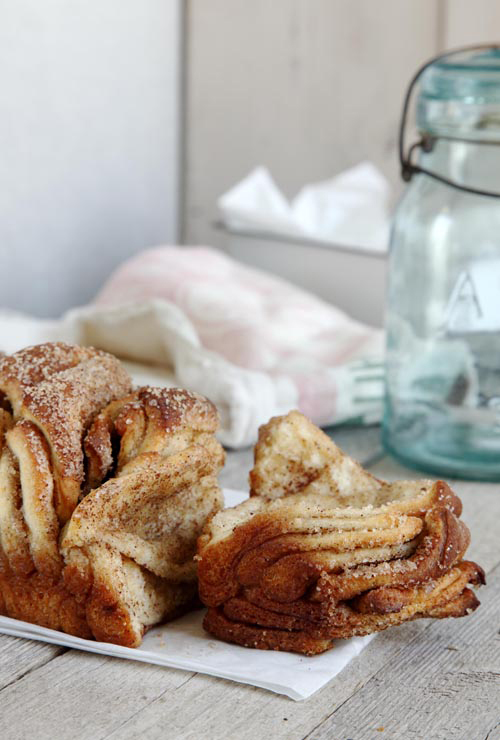 Typical cinnamon bread dough has sugar in it, as in this recipe. I wonder… is there such a thing as frozen sweet bread dough? That would definitely be a shortcut worth trying. We made this as a family, following the instructions to a tee. I am always afraid of yeast dough recipes as they can be soooo finiky! Well….this was AMAZING! The finished bread was light and not doughy at all. The perfect amount of sweetness, not too rich. Perfection! Thanks for your recipe! It is now one of our family traditions to make it for Christmas Morning Brunch. So happy you enjoyed it. its one of our favorites as well. Merry Xmas. This sounds great!! Do you thinks I can prepare this the night before (Christmas eve, I don’t want to spend all Christmas mornig baking while I can be opening presents with champange!) and leave in the fridge and bake in the morning? No problem. Make the dough and let it rise overnight. In the morning take it out of the fridge and let it sit until room temperature, and then you can prepare it. Merry X-mas! Made this tonight for a dessert. My husband LOVED IT!!! The dough was thick so my spatula did not hold up to the task. I used my hands and it worked well. Easy to make. Only problem I had was that I could not stop eating it. Thank you! I love Monkey Bread, but never made it. Its on my list of recipes to make! This looks wonderful!! Can’t wait to make it. Made it for breakfast with my 10 year old. Delicious! We couldn’t wait to let it rise a second time so just popped it into the oven as oven was warming, came out yum! So just a note to those impatient bakers- second rising may not be essential!! Thanks!!! Oh my gosh, these look amazingly delicious!! Looks perfect for weekend breakfast/brunch! I prepared this last night up until the last rising which was done in the fridge overnight so all I had to do was pop it in the oven this morning when I got up. I will definitely make it again. Next time I will either use quick rise yeast or proof the yeast in some of the warm liquid first. Great recipe!! I have just come across this recipe and will be trying it tomorrow. Please could you let me know if I need to use strong white bread flour or do I use just a self raising flour like for cakes or is it just a plain flour I use please? Tradionally we use strong white bread flour for breadmaking with yeast and the self raising for cakes and desserts. Sorry but we do not have an all purpose flour. Thank you for your advice and for this incredible looking recipe! This looks delicious! I want to add some slices of apples in there!